These high-quality valve springs are engineered specifically for Formula Ford 1600 racing engines. The seat pressure and installed height are optimized for the lift and RPM range on Formula Ford 1600 engines. Using these springs with the FF1600 camshaft and rockers results in 205-215 pounds of maximum spring pressure at full lift. This is strong enough to prevent valve float up to 8000 RPM without being so strong that horsepower is lost working against too-stiff springs. 75-80 pound seat pressure at 1.300" installed height. Set of 8 springs. 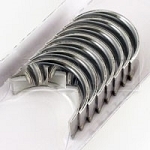 Note: These valve springs are designed to work on engines built within the Formula Ford 1600 engine rules. They are not for use in engines prepared to Production or GT rules. 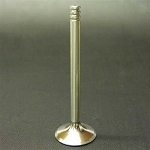 SCCA FF1600 rules dictate a maximum valve lift of 0.358". These springs will not work with higher-lift camshafts or high-ratio rocker arms. Exceeding the 0.358" valve lift limit will cause these springs to "coil bind" and will immediately result in bent pushrods (or worse)! Rings set racing =.005 over-ring lands are 1/16",5/64",5/32"